I’m going to indulge my love of books and the places you can find them. I love going to the library though with the busyness of life and the boys being older, I don’t go as often as I used to. I admit to not paying much attention to a library building or the interior when I visit one, but when libraries look like this, it’s probably fair to say that the books don’t get immediate attention. The Library of Trinity College in Dublin, the largest library in Ireland, which houses the Book of Kells. Yale University’s Beinecke Rare Book and Manuscript Library is one of the largest buildings in the world dedicated solely to rare books and manuscripts. The history of Prague’s Clementinum National Library dates from the existence of an 11th century chapel dedicated to Saint Clement. The library was founded in 1781 and has been the National Library since 1990. 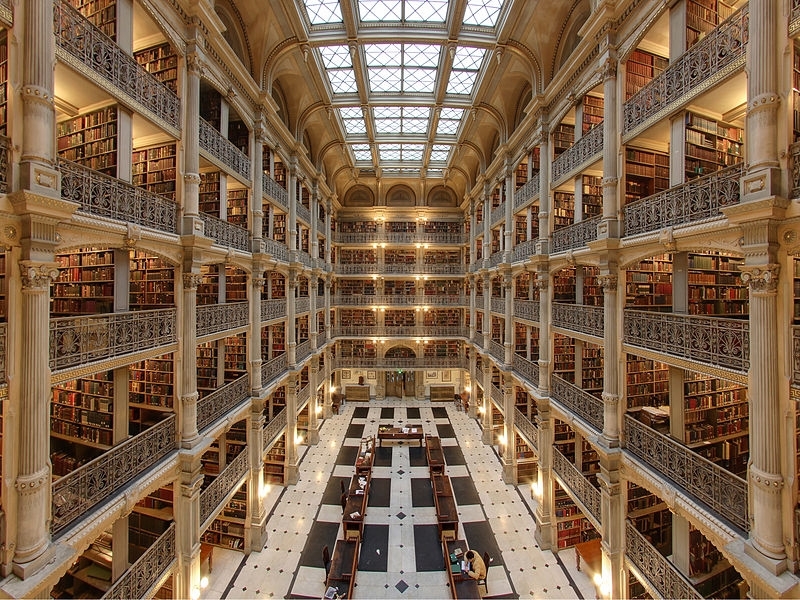 The George Peabody Library in Baltimore is the research library of The Johns Hopkins University. George Peabody was a merchant-banker-financier-philanthropist who wanted to create a library “for the free use of all persons who desire to consult it”. 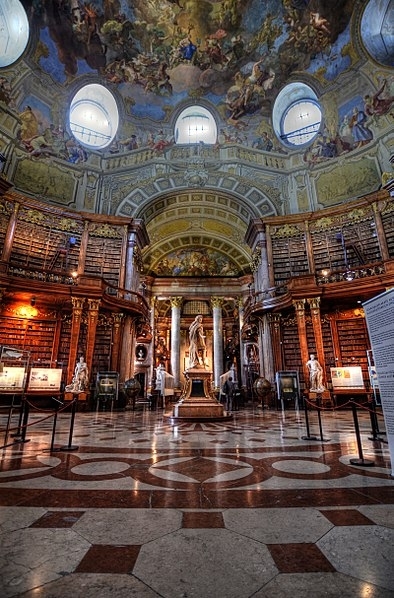 Austria’s National Library, founded by the Habsburgs, has its origins in the imperial library of the Middle Ages. Another library in Prague, the Strahov Monastery Library. In 1670, the philosopher and theologian, Jeronym Hirnheim, became the abbot of Strahov. He was responsible for the building of the new library in the Theological Hall, which was completed in 1679. The Library of El Escorial in Madrid, a historical royal residence, has, over the years, functioned as a monastery, basilica, royal palace, pantheon, library, museum, university and hospital. The library’s collection includes important illuminated manuscripts like the Golden Gospels of Henry III, which is an 11th century illuminated Gospel Book, probably produced under the patronage of Henry III, Holy Roman Emperor. The collection is located in a great hall with marble floors and carved wood shelves. The ceiling is decorated with frescoes depicting the seven liberal arts of Rhetoric, Dialectic, Music, Grammar, Arithmetic, Geometry and Astronomy; liberal arts being the subjects that were considered essential in classical antiquity. The Benedictine monastery of Admont is the oldest remaining monastery in Styria, in southeast Austria. 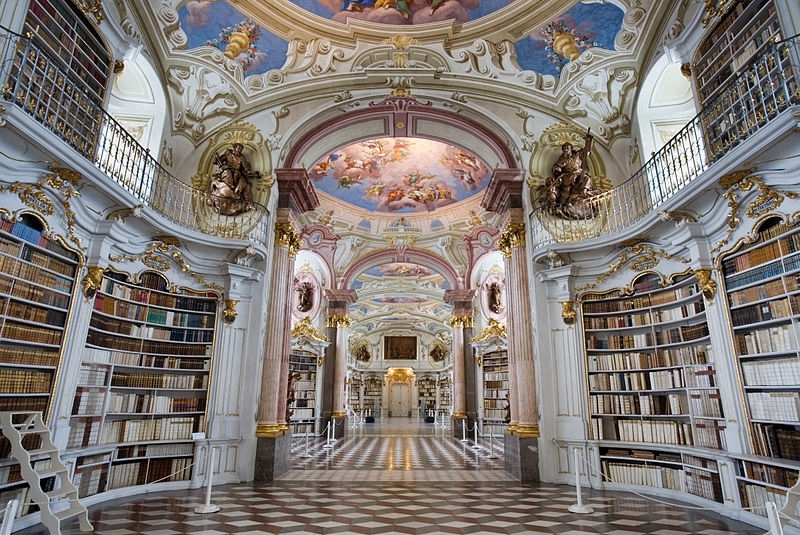 Known for its Baroque architecture, art and manuscripts, Admont Abbey houses the largest monastic library in the world. The ceiling consists of seven cupolas, decorated with frescoes showing the stages of human knowledge culminating in Divine Revelation. 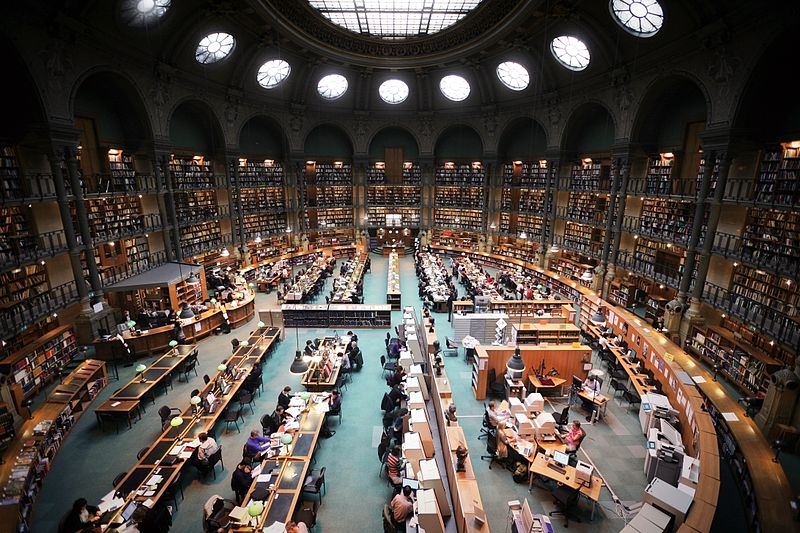 The National Library of France – Bibliotheque Nationale de France – has its origins in the royal library founded by Charles V at the Louvre Palace in 1368. It’s the national repository of everything published in France as well as extensive historical collections. The Abbey Library of St. Gallen in Switzerland was founded by Saint Othmar, who’d founded the Abbey of St. Gall in the 8th century. The abbey was destroyed in a fire in 937, but the library remained intact. The library hall was constructed between 1758 and 1767. One of the earliest and most important monastic libraries in the world, the library collection is the oldest in Switzerland. Canada’s Library of Parliament is the main source of information and research for the Parliament of Canada.